Organization may seem impossible. 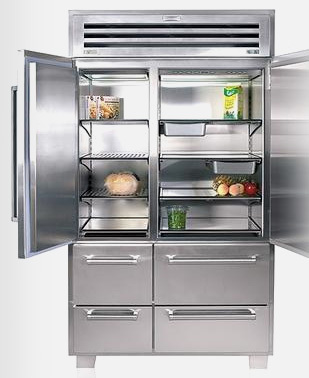 Refrigerators are often messy and confusing, and it seems like an impossible task to try and sort it all out. With this guide, watch your refrigerator go from a confusing array of food to a neat arrangement. Take everything out of the fridge. You must start with the fridge completely empty so this can work. Throw out all unused/expired foods. Put the butter and cream cheese into the door of the fridge. A covered section can usually be found at the top of the door, but if not, put it on the top shelf of the door. In the remaining shelves on the door, place your sauces, dressings, condiments, and cheese. Examples are: chili sauce, salad dressing, ketchup, and cheddar cheese. Put your drinks on the largest shelf on the inside of your fridge, since they are usually the tallest items you will store. This is usually at the top on the inside. There will usually be at least two drawers in the bottom of the fridge. In one, put vegetables, like lettuce, herbs, tomatoes, and peppers. In the other, put meats that do not need to be frozen, such as sandwich cold cuts, sausages, and pepperoni and sandwich meats. If you live in a home where you do not make sandwiches with cold cuts, you can divide the veggies into two sections and put them here or put fruits in here (if you refrigerate your fruits). Now separate the rest of your food. You will often have yogurt, sour cream, eggs, and similar food products. Put them together on a shelf. Put all the 'leftovers' on a shelf. Use up the remaining shelves by putting food products that share things in common together. In the freezer, separate the ice cream, meats, frozen foods, and 'leftovers' in an organized way. Try to keep your head clear of impatient or messy thoughts. Organize foods in a way that seems smartest; put the foods you eat most often at the front, and the ones you eat the least at the back. Put the foods that are related together: meats, dairy, fruits, vegetables. You can also work by emptying one shelf at a time, if unloading the entire appliance seems overwhelming to you. Remember that most refrigerator shelves are both adjustable and removable. You can move or even remove shelves if you need a different configuration.